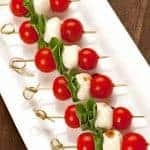 A simple twist on a traditional Caprese salad, these colorful skewers of ripe cherry tomatoes, fragrant basil and fresh mozzarella are an easy, no-cook appetizer that looks every bit as good as it tastes. Thread a cherry tomato onto each of the skewers. Fold the basil leaves accordion style and thread onto the skewers, followed by a boccancini and a second cherry tomato. Serve with the balsamic reduction for drizzling. Balsamic glaze is a wonderful ingredient that can be found in the condiment aisle of many supermarkets. A little goes a long way and it’s delicious drizzled over all sorts of meats and veggies. A balsamic reduction is very easy to make and keeps safely in the refrigerator for at least a month. Place 1/2 cup of balsamic vinegar in small saucepan and bring to a slow simmer over medium heat. Continue cooking, stirring occasionally, until it reaches the consistency of maple syrup. You should have about 1/3 cup. Remove from the heat and allow to cool completely before serving. The glaze will thicken a little more as it cools.